Round Top Inn welcomes you to the heart of the Texas countryside. Relax, put your boots up and stay awhile! We’re located in downtown Round Top, a tiny community known as one of the most charming and vibrant small towns in Texas. Unique boutiques, galleries and restaurants are only a short stroll away. Or, if you prefer, a gentle back roads bike ride is just outside your door. Our lush, one-acre property is a collection of vintage farmhouses and cottages set on manicured grounds framed by majestic oaks. Each of our thirteen lovingly restored guestrooms is decorated with antiques and artistic touches in a style known around here as sophisticated country. We aim to offer joyful and authentic hospitality in every way we can, so look forward to luxurious bed linens, a full, hot delicious savory breakfast and the finest amenities and conveniences including free Wi-Fi. Both our Dining Room and Segar House Lounge are available throughout your visit as additional spaces for gathering or getting away from it all. Whether you’re planning a destination wedding, family reunion, company retreat, weekend adventure, romantic getaway or simply a personal recharge, we look forward to seeing you! 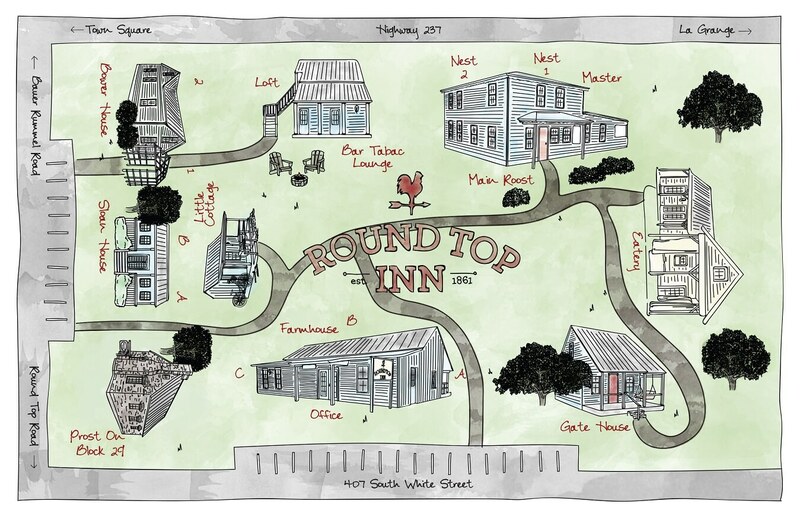 Click here to check availability and book your stay at Round Top Inn.